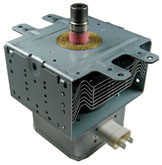 ERP 10QBP1003 Microwave Oven Magnetron. Fits many makes and models of microwave ovens. Replaces Whirlpool W10282794 8206079.